UPDATE: 04/01/2018 Mother, father and son have not settled with Uber. Only the husband and daughter. The mother is Sharon Elain Collins Wood Daly. I don't yet know who is the son and father. UPDATE: Uber just settled a case from the daughter and husband of Elaine Herzberg who was killed. They didn't release the names. I posted them below. We know she had three husbands. Myrone Herzberg died. I thought that was her last husband as she used his name. I would think the previous two were ex-husbands. I'm amazed her mother didn't join in the lawsuit. Maybe she will file her own lawsuit later. Her husband was Rolf Erich Ziemann born about January 1973. They were married around 2011 per his FB. It appears he was in a relationship with someone else in 2017. He states he's from Germany. Christine Terresa Wood Paredes may be is her daughter. Looks like he posted this right after getting the signed settlement agreement. He didn't post anything about her in a long while. He was even seeing someone else. Maybe they got married so he could get citizenship? He also has a record. Resisting arrest, drug paraphernalia, false report to law enforcement, dangerous drug violation, aggravated assault - guilty, illegal control of enterprise, computer tampering, crimpossession of forgery device. There was a warrant for his arrest in 2017. I hate to say this but I think this money may not be good for him. I think the daughter is Christine Terresa Wood aka Christine Paredes married to Jorge Miron Paredes in 2006. She divorced him 2008. It was a horrible divorce with many hearings. She married Jose Angel Millan-Osuna in 2009. She has four kids whom she may have lost custody of at one point? And of course she also has a criminal record. When she gets the money I see her blowing it quickly while making bad decisions. I'm sure mom will file her own lawsuit. Mom looks exactly like Elaine and talks about drug addiction. 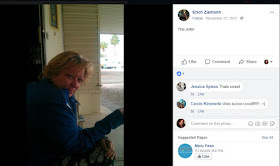 ORIGINAL: Who was the homeless woman Elaine Marie Herzberg who was hit by an Uber in automatic mode and died? She was born August 2, 1968 as Elaine Marie Wood. She was called Elle. She grew up in Apache, Arizona and went to Apache Junction High School​ graduating in 1985. Below is a school yearbook photo from 1985. Elaine Wood married Myron Max Herzberg January 25, 1999 in Las Vegas when she was 31 and he was 53. Myron was born 1946 and died in 2008. Elaine became the step mom of Tina Marie Herzberg White. It seems Myron also had some issues. He was arrested for disorderly conduct, assault/touch to injure in 2000, theft 2002, 2008 he was sued for default, repossession of home, 1997 driving with suspended license and 2005 a crime which caused him to be on probation. 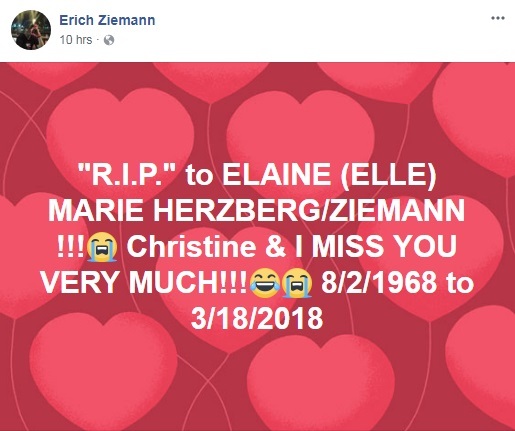 Per her Facebook page (she has a few Elle Wood Ziemann Elle Wood Elle Wood Ella Wood Elle Wood Elaine Herzberg) she "became a mother at 15yrs. old ~ had daughter at 18yrs. old ~ married 3 xs." I see her having been married to Herzberg, Ziemann and perhaps Tony. Her real daughter has allegedly already filed suit against Uber. Her mother may be Sharon Elaine Collins Wood Daly aka Jody still living in Apache Junction, Arizona with current husband Mark L Daly. Sharon it seems took care of Elaine's baby. All these people are on Facebook. By now everyone knows of her lengthy criminal history. They are small crimes for drugs, driving without a license and not leaving an apartment. 08/03/1993 J-1001-TR-930222513 Traffic She went by Ela Wood with same birth date. 09/15/1997 J-1001-CR-977144862 May be about child support. 09/23/1997 J-1001-CR-977149882 She went by Ela Wood then. 08/12/1998 S-1100-SE-12154 Sharon Elain Collins born 1949 is also a plaintiff. There is a Sharon E Wood same age. This could be her mother. This is about her kid and child support. 10/08/1998 S-0700-CR-1998013214 Could be child support. 02/22/1999 0701TR-9902171 Driving with suspended revoked license, pleaded guilty. 5'2" 135 lbs Blonde hair. Blue eyes. 11/29/1999 M-0741-2239267 Failure to put money in meter. Did not appear. 06/18/2001 J-1307-TR-20012299 Speed greater than reasonable and prudent. Failed to appear. They couldn't find her. She had a judgment against her with fines. 08/04/2003 S-1100-SE-200300653 She was sued by the state and Sharon E Daly born 1949 for child support. That ended in 2005. 02/10/2009 S-0700-CR-2009109947 Criminal impersonation, forgery, marijuana violation, false report to law enforcement. She pleaded to some charges while two were dismissed. Probation. Criminal restitution. 03/25/2010 TR2010-116360 No mandatory insurance, driving with suspended license, violation of promise to appear. Pleaded guilty. 07/12/2012 CC2012-132961 Forcible detainer hearing. Eviction. She was evicted and owes about $1,500 in rent. 06/06/2014 S-0700-CR-2014125642 Marijuana, drug paraphernlis. Guilty. 11/13/2014 S-0700-CR-2014153799 Dangerous drug violation, drug paraphernalia. 12/04/2017 S-0700-CR-2017155123 She has a preliminary hearing coming up 04/03/2018. It doesn't say what it's for but it's criminal and appears more serious than the other offenses. Below is video of what happened from the inside and outside of the vehicle. It appears she wasn't paying attention and walked into the street with a car coming toward her with the lights on. She didn't even look at the car until she was directly in front of it. Maybe she assumed the driver would see her and stop. I've seen some homeless do that. Still, the driver clearly wasn't paying attention. Perhaps he should have had his high beams on and was looking at the road. It's odd the car didn't sense Elaine and her bicycle and stop. It'll be interesting to see what happened. What records I have for her show her living in Scottsdale, Chandler, Tucson, Arizona. There isn't much more to her story that I can find. I will update the article.